The Voucher Express Gift List provides a fresh approach to traditional gift lists but don't just take our word for it. Voucher Express has been operating wedding gift lists since 2001 and in that time we've managed hundreds of gift list accounts. "The site is extremely easy to use and served its purpose very well. We took quite a while to close our account and the customer service throughout this time was excellent. Thank you". "The Gift List is very straightforward to use. All our wedding guests accessed with ease. Thank you!". "Very convenient, easy to use, customer service was up to standard. Speedy delivery, and a variety of stores to choose from". "Great gift my bridesmaids got for me when I moved to the UK. Helped save on my luggage limit (& sanity!) for moving here. With The Gift List I chose where we'd get the little things that made our house a home." “The Gift List was the perfect solution for friends and family invited to our wedding with everything very straight forward and the personal service via email was excellent. We opted for all our vouchers to be sent for Next and requested this by email on a Thursday and as specified by me delivered the Saturday morning. Great to see a company offering an efficient, simple to use & personalised service which we highly recommend to anybody getting married. Thank you so much from Mr & Mrs Baker”. "The website was so easy to use and set up our profile. Our guests found it easy to use." "I found the Gift List site really easy to use and had nothing but positive feedback from our guests. Whenever I contacted customer services they were always very polite and happy to help. Couldn’t have asked for a better service." "We thought The Gift List was brilliant in every way - we're so pleased we discovered you! Thankyou." "Really easy to set up and manage. Enjoyed seeing comments. Customer service was excellent and any problems or queries were dealt with efficiently and professionally - Thank you." Eve Strachan, Gift List closed November 2013. "A fantastic idea for a wedding gift list., which has enabled us to book a wonderful honeymoon in Mauritius - very excited!" "Fabulous and hassle free wedding gift list. Perfect." "Fantastic service and so easy to use, for us and out guests. Customer service were also really helpful and friendly from beginning to end." "A fantastic idea as we had friends abroad so it made things very easy for our wedding gifts. Service was outstanding." "Fantastic & flexible option for wedding gifts yet still very personal with comments option for contribution of a gift." "Highly recommend for future Brides & Grooms. Easy for guests to use. Brillant service." "It was great to have the range of gift vouchers to choose from and know how they are usable nation wide, Many thanks!" "A really great service with exceptional customer service. Thank you!" "Excellent and easy to use website/service. Love d the personalisation facility and the printed stationery was lovely. Looked great in our envelope invites. Highly recommended." "Easy to use website and friendly customer service. When your vouchers are claimed & sent in the post, your messages from guests are included. Nice touch." "Really easy to use, great idea. Love the ability to donate to charity too." "Very impressed, would recommend and use again!" "The Gift List helped to make our wedding even more special and we were delighted to be able to give something back via the charity donation." "Very easy to use, great that there are no fees and brilliant customer service. Thanks"
"We got married in July this year (2011) and used the Gift list website. At first I thought this is too good to be true, but the service was excellent, their communication skills with customers is top rated (best I have seen in a long time), it was a real pleasure being able to use their site. Even better, as soon as we were ready to redeem our vouchers, one phone call straight through to them and they were sent out immediately. They certainly made the whole process feel personalised. I will recommend them to everyone." "All my guests loved the site, they thought it was a better gift idea than buying us things we might not use. I felt it was a very easy and straight forward site to use. I have been recommending it to other couples to use." "I found your site fun and easy to use I loved the fact that we were able to make it our own...it was very straight forward, easy to use and loved the fact guests could leave a personal message just for us." "This site is a brilliant to organise Voucher Wedding List. Excellent customer service." "The site was so easy, just as I wanted, so our guests would not be put off using it." "The Gift List was exactly what we were looking for when it came to our Wedding List and really liked the choice of vouchers. Excellent service, so many of our Wedding guests have said how brilliant and easy the process was." "I just wanted to say how fantastic using your service was-we have had nothing but great feedback on how simple and effective your service is. We used this for our wedding gift list and we have recommended your site to all that attended our wedding. I am positive that we will use your site over and over again for any occasion - Baby showers, Christenings, etc, etc." "Great service, takes the hassle out organising tradtional gift lists." "Great idea, great access and great service! This arrangement provided a wide variety of choices for us and options to purchase gifts across a whole range of services-thank you!" "We found the site and service to be truly excellent from start to finish and would have no hesitation in recommending you to anyone. Many Thanks for a first class service." "We used the Gift List with Voucher Express for our wedding and found the service to be fast, efficient and reliable. It was easy to use for our guests and we wouldn't hesitate to recommend it." "The Voucher Express Gift List was exactly what we were looking for. We were very impressed with how easy it was to set up and the exceptional service we received when it came to the time for us to close the account and receive our vouchers - Thank you!" "We couldn't fault anything - this list was the most straight forward and stress-free solution - Thank you so much!" "We hunted all over the internet for the best place to go for a wedding gift list and this was the best. We had no problems with anything. We got our vouchers very quickly." "Fantastic service, really efficient and friendly. Would definately recommend service and would happily use it again. Thanks!" "I was very happy with your service from start to finish!" "Very happy with every part of the service and this website has made for an better wedding day due to all the gift sent via the gift list." "Ideal for couples who spend most of their time outside the UK. The only Gift List that covers all high street shops." Jacqueline Tang, Bath. Gift List closed in December 2010. "Personlised, cringe free gifting. Efficient and problem free way of selecting gifts. Great customer service." "Absolutely brilliant! (Staff) Helpful but unintrusive. The whole process was easy and my guests all commented on what a good idea it was. Thank you!" "All our dealings were well managed, helpful and straight foward. Perfect!!" "1st class service and fast delivery, just what's required for wedding service"
"Great customer service with a wide range of vouchers available." "The service provided was brilliant, very helpful and efficient from start to finish. We would definitely recommend your business. We loved the homepage, it was great to have a personal touch and the website was easy to use. Thank you Voucher Express for all your help with our wedding gift list. We will definately recommend you to friends and family." "Very easy to use and keep track of - recommend to anyone, especially stressing brides to be!" "We found voucher express provided a perfect solution for couples like us who have been together long enough not to need the usual gifts and who want the option of choosing something in the future." "Voucher Express posed the perfect solution to the fact we liked lots of things from different stores. It meant that our guests just needed to buy in one place and we were able to go on several shopping sprees after our honeymoon, and buy exactly we wanted." "I am very happy with the service we have received from Voucher Express and would happily recommend you to friends and family. Thank you for all your kind attention." "I couldn't fault a thing with Voucher Express. Everything from start to finish was excellent...I would advise everyone to use Voucher Express if they want a quick, easy and reliable service. Well done all at Voucher Express." "Great range of vouchers available. Great to receive regular contact. Thank you very much. Great service, friendly staff, very efficient. Totally stress free which is fantastic whilst organising a wedding!" "Very smooth & easy to use." "Huge variety. Excellent service, rung to request vouchers on the Friday, received them in the post on the Saturday." "Excellent ... Always received email updates." "I was really pleased with the way in which we could supply our guests with a means to purchase vouchers without having to actually buy them. This meant that we didn’t end up with lots of vouchers for one particular shop as we could decide which vouchers we wanted at the end of the Gift List period in order to buy what we needed from where we wanted to get it from. We have spent all our vouchers now which is great as I still have vouchers from other occasions for places I rarely buy from and may soon expire. This method is far better." "All in all an excellent way to receive your gifts if you want to save for a big purchase, want things from a variety of shops or even wait for the sales! A professional, friendly, fast and easy service to use. Friends and family found it easy to use as well. Would highly recommend Voucher Express!! 'Thank you for your service, absolutely ideal! Just as I was thinking 'if only', I found Voucher Express!! Thank goodness someone actually provides the service we all want." "All questions answered quickly. A very good selection of vouchers. Quick service and easy to understand. I would recommend the service to friends, as a friend did with us." "Easy to use. Nice to receive the guests' comments on cards after the wedding." "We thought it was brilliant using Voucher Express as we didn't know what presents we really needed when we got married. 12-months on and having moved into a new house the vouchers are meaning we can buy things we can remember our wedding by that we have chosen. VE gave us everything we wanted: a secure easy way for friends to buy us something for our wedding, and for us the control to use the money in stores that we want on things that we want." "Customer service was excellent ... completely stress free ... delivery was quick ... gave the personal touch ... and telephone contact was very pleasant. Thank you so much for your care and attention." "Very easy, efficient service. Thank you!" "Both myself and my husband were delighted with the flexibility, variety and the service that we received from Voucher Express. We found the service ideal for us as we preferred to have vouchers rather than a selected wedding list. Receiving vouchers as a wedding gift enabled us to buy things as we needed them and even a year on we've been using our vouchers towards our 8 week old baby girl!" "It was a useful, easy to use gift list website for my wedding. Quick delivery too. Would recommend it". "Fantastic service, easy to use and our wedding guests loved it!" "We have found this to be very useful and efficient". "I am so thankful that we found The Gift List for our international wedding registry! The customer service was awesome and it made everything so easy for our guests!" "The site was extremely easy to use, provided a wide range of gifts and was the perfect option for my wedding gift list." "Great concept, fantastic site and service start to finish was excellent." David Allen, Gift List closed November 2013. "The site is very easy to use and offered a variety of places to use. I would recommended the site to use and how easy it is to set up and close down. Delivery was very quick!" Emily Perry, Gift List closed November 2013. "Thank you for helping us raise money in vouchers to give as a thank you to participants in our project. Its a really neat way to fundraise." Future Theatres Company, Gift List closed Sept 2013. "Easy to use, first class service. Perfect for our wedding gift list. Would definitely recommend." "Excellent service, easy to use website and tailored to meet the needs of busy couples preparing for their big day and newly weds. Thank you." "The service was great. Everything we could have hoped for! Thank you." "The Gift List website was a great idea. I was surprised how easy it was to use." "Perfect for a wedding! Much better than a list of gifts with prices." "It was easy from beginning to end." "The Gift List was easy to use and the customer service was excellent." "We were delighted with your service and can't recommend Voucher Express enough! Thank you very much!" "An excellent way to set up a gift list for your guests if you already have your home set up." "Trustworthy, speedy delivery, great service." "As most of our guests weren't local, setting up a Gift List was the best way to help them. They found, as we did, the site to be well laid out and organised. I would certainly recommend it to others." "Thank you so much for your fantastic service, we wouldn't have believed it was possible had we not been told about it by a friend. Absolutely perfect for our wedding! We were very impressed! It was completely free and with no catch. The business cards to put into our guests invitations were a nice touch as well. We will definately be recommending The Gift to others"
"I found the Gift List extremely professional and excellent communication at all times either by phone or by email." "Once the account had been closed the team were so efficient and helpful, particularly when it took us a while to decide what vouchers we wanted they did not rush us at all and allowed us to take our time to choose. The communication from the team was very quick and efficient." "We signed up for the Gift List service on the recommendation of my sister in law and have been very impressed! The range of gifts is fantastic and 'Open Pot' allowed us to decide exactly where we wanted to get our vouchers for. We were kept up to date with the status of our account every step of the way and when we closed our account to order our vouchers they were despatched the very next day. I really cannot recommend the Gift List highly enough. Thank you so much for your fantastic service, it has taken the stress out of 'Gift Lists' and helped provide us with a great start to married life!" 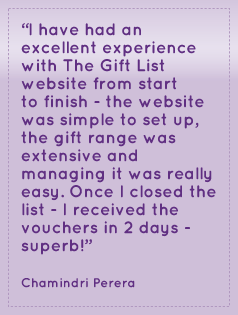 "I have had an excellent experience with The Gift List website from start to finish - the website was simple to set up, the gift range was extensive and managing it was really easy. Once I closed the list - I received the vouchers in 2 days - superb!" "Using the Gift List for our Wedding was perfect. Easy to set up and personalise homepage to incorporate Wedding themes. Guests loved it and was so simple and we had a great choice of vouchers to choose from afterwards." "We recently had two weddings - one in the UK and one in South Africa. We were really struggling to find a way people could buy us gifts without giving us foreign cash and this site fixed the problem. It was so easy to set up, easy for guests to use and easy to close. We found the service first class all the way." "Exellent service. Thanks for your help!" "Would recommend and use The Gift List again." "Thanks for a great service. Our guests thought it was easy to use. We loved it because of the choice, reliability and flexibility." "A great service, easy to use. Just brilliant for a good collection." "Thanks for a great service from start to finish, The Voucher Express Gift List was a perfect solution for us as we didn’t want toasters or kettles. We will be recommending you to all our friends. Thanks again"
"An excellent service - thank you!" "We thought the service was perfect to meet our needs for our wedding list as having lived together for four years we had almost everything we need. Using the voucher gift list enabled us to choose exactly what we wanted and family and friends all commented on how easy it was to use and contribute. We will certainly be recommending the website to friends that are getting later married this year! We have been very impressed with how interactive the website has been and further impressed with the personal service received from the gift list team." "We wanted to say that we have had such a positive experience using The Gift List! Since we are from different countries, The Gift List gave us an easy and convenient solution for a wedding registry. Our vouchers arrived in the mail today, and now that we are settled we are very excited to start furnishing our home! We've already recommended this to our friends who have decided to use it for their wedding in June, and we won't hesitate to use this website again! The Gift list really was our saving grace for a wedding registry, we'd have been lost without it! I hope other people can benefit from your site if they are in a similar situation. I really want to emphasize how great it was to work with you, we kept thinking this is too good to be true, where's the catch?! And there isn't one! Thank you for everything!" "I loved how friends and family could leave us messages and how much choice we had for our voucher list. I would definately recommend it to others for all occassions." Jodie Lazarus, Gift List closed January 2011. "A fantastic service providing you with great choice, superb service and so easy to use. Would certainly recommend this site to anybody looking for one less stress to be taken out of their wedding day planning! Thank you." "Everything was great! Easiest gift list to use out of all that I researched.Thanks!" We received fantastic, quick customer service when establishing our list. Great chocolates too! "Fantastic, easy. Helped us get what we wanted." "We were delighted with the service provided by Voucher Express and would recommend to anyone!" "Excellent service. Site very easy to use. Next day delivery of vouchers. Would thoroughly recommend." "Very easy to set up, wide choice of vouchers to choose from. Easy access to check Gift List especially once notified by email. Absolutely great, will use again for sure." "I would recommend the Gift List to anyone - the perfect solution!" "Great website that allows others to leave gifts safely and securely and you get to choose what you want!" "We had a fantastic wedding and our gifts were made so easy by the use of this site. Your staff were so helpful and easy to talk with. The vouchers came really quickly once settled and we got exactly what we wanted. Will use again and will recommend to anyone. Fantastic keep it up!" "Very quick and easy to set up. Good delivery service when closed list." "Great help to us. Always quick to answer questions and queries and also providing regular updates on our account! Many Thanks." "Excellent! Very helpful, kept us informed at every stage. Will recommend your service to all my friends and family. Thanks very much." "The service we received was fantastic. Very helpful, very efficient and very friendly. The whole system was easy to use, all our guests raved about how simple it was. From 17 year olds to 73 year olds all used it with ease. The little cards for the details were a great asset, perfect to fit inside our invites. The only problem, (not a bad problem) was, there are far too many vouchers to choose from, it took ages to decide which ones we wanted, but we had fun deciding. You didn't even mind us taking 6 months to decide, you just kept us updated with the value we had to spend. Once decided, the vouchers arrived very promptly. We would recommend you to any one and every one. Thanks for a great service." "(Staff) Always exceptionally helpful - both on the phone and by email." "Excellent choice. Overall a great service-thanks." "We found the service was great and our guests had no problem in ordering gift vouchers. The fact that we had most things for the home already as many couples in their late 30's do, the vouchers were a great alternative to the usual shop wedding lists and useful to sort out our jungle of a garden! We even managed to afford a shed much to Mark's delight." "I found Voucher Express to provide a very friendly and professional service. Our guests found it easy to register their gift with Voucher Express and we received the vouchers very swiftly once we closed the account. I would recommend Voucher Express to anyone and it is an ideal alternative to going through the lengthy process of drawing up a normal wedding gift list." "Answers were clear, team friendly & efficient. Happy with the service and got a good selection of vouchers." "Guests commented on how easy it was to use, really pleased with the service you provided." "Service was very efficient. Friendly and helpful staff. Very impressed that the vouchers arrived the next day." "Service was excellent - a great idea for people who don't feel comfortable with a wedding list.....speed of delivery was excellent." "The service that Voucher Express offered was fantastic and took the stress out of making a gift list. Our guests found the service easy to use and we were able to buy exactly what we wanted, rather than receiving 3 toasters! We were really pleased that the vouchers all arrived in separate cards from each guest and it was very exciting opening them. The customer service both by email and telephone was very friendly and helpful, which for a stressed out bride is wonderful!" "The service we received was excellent and we would recommend Voucher Express to anyone." "We are extremely happy that we chose Voucher Express, as not only did it make our friends and families' lives easier when deciding what to get us, but it also gave us an opportunity to choose how much in vouchers we want to spend and where we wanted to spend them. There are so many retailers to choose from but our best selection had to be the Thomas Cook vouchers which helped contribute to a holiday. Our representative was very efficient as any queries were answered immediately and in a very professional manner. It could not have gone any smoother." "Quick & friendly...excellent service...we are very pleased...we're enjoying spending them at the moment."